After dark hundreds of people, young and old, walk the streets to admire the altars and enjoy the treats handed out by homeowners—fruit drinks, candies, ice cream, nuts and chilacayote, a type of candied squash customarily served on this day. Viernes de Dolores signifies the beginning of Holy Week. Although the custom dates back to the Spanish colonial times of the 1600s, today it is unique to the state of Guanajuato and the Bajío region. Seafood dishes are common in Mexico for Lent, when the beloved pork is put away. Pumpkin seed sauce or Pipian, is made from ground pumpkin seeds, which have been used since Aztec times to thicken and enrich various sauces. For health reasons, this recipe eliminates the oil called for in most recipes without sacrificing much flavor. 1. Toast the pumpkin seeds in a frying pan over high heat or under a broiler, stirring frequently so they don’t burn. (avoid browning them excessively, in order to maintain the green color needed for the sauce.) Seperate 1/4 cup and set aside for the garnish. Toast the sesame seeds in the same manner. 2. Place the tomatillos, chile, onion and garlic on a tray under the broiler until soft. About 10 minutes. 3. Place all the ingredients up until the chicken stock in a blender. Add the chicken stock and puree until smooth. 4. Pour the sauce into a stock pot on high heat. Bring to a boil, then reduce heat and let simmer for about 45 minutes, or until thick. Add the salt and pepper. 5. While the Pipian is simmering, bring a large pot of water to a boil. Add the shrimp and cook for about 5 minutes or until done. Drain. 6. Mix the shrimp into the pumpkin seed sauce. 7. Garnish with the remaining 1/4 cup of toasted pumpkin seeds. 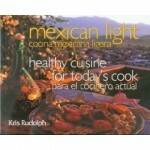 This entry was posted on Wednesday, March 31st, 2010 at 8:41 pm	and is filed under Mexico, Recipes. You can follow any responses to this entry through the RSS 2.0 feed. You can leave a response, or trackback from your own site.